New York Attorney General Eric Schneiderman speaks during a press conference at the office of the New York Attorney General, September 13, 2016 in New York City. NEW YORK — The special prosecutor investigating former New York Attorney General Eric Schneiderman said Thursday that she couldn't bring criminal charges over allegations he physically abused women he dated, in part, because current state law doesn't explicitly outlaw such behavior. Schneiderman, 63, said he recognizes that Nassau County District Attorney Madeline Singas' decision "does not mean I have done nothing wrong." In closing the six-month investigation, Singas implored lawmakers to pass legislation to criminalize slapping, shoving and other violence committed for sexual gratification. Schneiderman said through a publicist he accepts "full responsibility for my conduct in my relationships with my accusers, and for the impact it had on them." "After spending time in a rehab facility, I am committed to a lifelong path of recovery and making amends to those I have harmed," Schneiderman said. "I apologize for any and all pain that I have caused, and I apologize to the people of the State of New York for disappointing them after they put their trust in me." 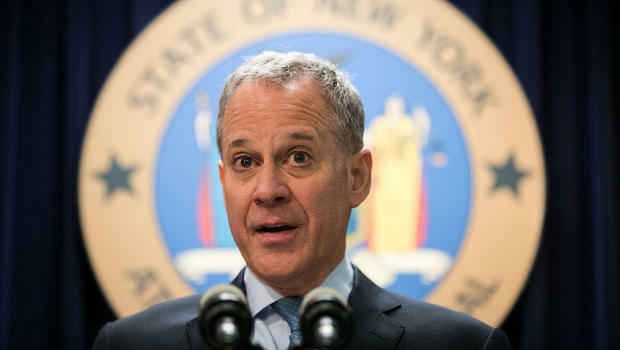 Michelle Manning Barish, a Democratic activist and writer, said Schneiderman became controlling and abusive – slapping her hard across the face and choking her – soon after they started dating in mid-2013. "Without it, abusers can get off scot-free – even when they later admit to the behavior, as Mr. Schneiderman did today," Katz said. Letitia James was elected to succeed Schneiderman Tuesday. She will take over the post from Interim Attorney General Barbara Underwood, who was appointed to serve out the remainder of Schneiderman's second term, through Dec. 31, CBS New York reports. Young women: What’s on their minds as midterm elections approach?